Reason for Reading: Loved The Corrections and happened to walk by How to be Alone at the library. 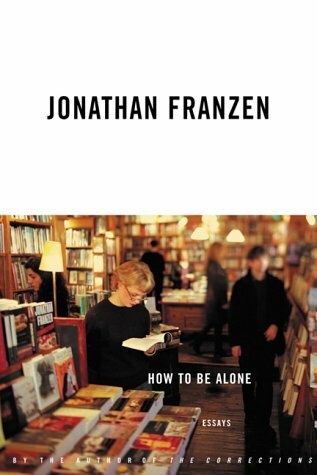 Synopsis: In this collection of thirteen essays, Franzen gives his opinion on a variety of aspects of modern life that lead to a more isolated society, including the decline of the reader, smokers, dealing with diseases like his father’s Alzheimer’s, and how suburbia is winning out over big cities at the cost of the artistic community. Why you should read this book: As a reader, it’s always interesting to have a look at other readers, the people who pick up a book instead of flipping on the television even though it seems like the rest of the world is changing the channel to the latest ‘reality’ show. Franzen isn’t afraid to take a strong stance, even if it’s not the sugar-coated response we would like to hear – maybe we should be hysterical over the state of society, but not over the things that the media has trained us to get worked up over. A nice mix of personal antidotes mixed with opinions that are backed up by facts. Here’s a memory. On an overcast morning in February 1996, I received in the mail from my mother, in St. Louis, a Valentine’s package containing one pinkly romantic greeting card, two four-ounce Mr. Goodbars, one hollow red filigree heart on a loop of thread, and one copy of a neuropathologist’s report on my father’s brain autopsy. The invitation to leave your depression behind, whether through medication or therapy or effort of will, seems like an invitation to turn your back on all your dark insights into the corruption and infantilism and self-delusion of the brave new McWorld. And these insights are the sole legacy of the social novelist who desires to represent the world not simply in its detail but in its essence, to shine light on the morally blind eye of the virtual whirlwind, and who believes that human beings deserve better than the future of attractively priced electronic panderings that is even now being conspired for them. Instead of saying I am depressed, you want to say I am right! I love novels as much as Birkerts does, and I, too, have felt rescued by them. I’m moved by his pleading, as a lobbyist in the cause of literature, for the intellectual subsidy of his client. But novelists want their work to be enjoyed, not taken as medicine. Blaming the novel’s eclipse on infernal technologies and treasonous literary critics, as Birkerts does, will not undo the damage. Neither will the argument that reading enriches us. Ultimately, if novelists want their work to be read, the responsibility for making it attractive and imperative is solely their own. Also recommended: Dude, Where’s My Country? by Michael Moore; 84, Charing Cross Road by Helene Hanff. Also by this author: The Discomfort Zone: A Personal History; The Twenty-Seventh City; Strong Motion; The Corrections.